For the fifth time, the federal agencies that run the Columbia and Snake river hydropower system must demonstrate to a judge’s satisfaction they can do so without killing off the region’s threatened and endangered salmon and steelhead. Public hearings will kick off throughout the region this month to inform an environmental review of operations of the Columbia River and Lower Snake River dams. The federal Columbia River hydropower system, operated by the U.S. Army Corps of Engineers, is under a federal court-ordered scrutiny of the dams’ environmental effects. The dams provide hydroelectricity, irrigation, navigation and recreation benefits to the region. So-called public scoping hearings throughout the region, intended to guide an environmental-impact statement ordered by a judge, will start Oct. 24 in Wenatchee. The only hearing in Seattle is scheduled for Dec. 1 in the Great Room of Town Hall at 1119 Eighth Ave. from 4 to 7 p.m. 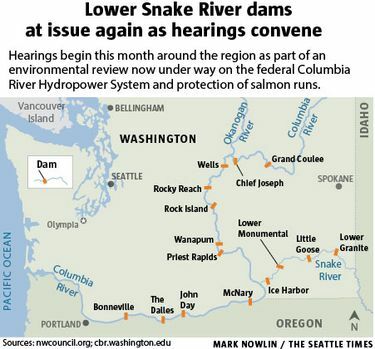 The purpose of the review is to gauge the effects of long-term dam operations at the 14 federally operated hydropower facilities up and down the Columbia and Lower Snake rivers on fish, wildlife, irrigation, navigation, native cultures and more. The hearings are convened by the Bonneville Power Administration, which markets power from the dams, and the Army Corps of Engineers and the Bureau of Reclamation, which operate the dams. The agencies are charged with coming up with an operations plan that will protect and recover populations of endangered and threatened salmon and steelhead. The review is the result of a U.S. District Court ruling last May siding with businesses, conservation groups, alternative-energy advocates, the state of Oregon and the Nez Perce Tribe, which have challenged dam operations in court as lethal to salmon and steelhead. Operations at the dams continue under a provisional permit while the court review is under way. Today 13 runs of Columbia and Snake river salmon and steelhead are at risk and still slipping away, despite billions of dollars spent to save them, U.S. District Court Judge Michael Simon of Oregon stated in his ruling. He demanded a do-over of previous so-called biological opinions, created by the agencies defending dam operations. This time around, all aspects of operations and strategies for fish and wildlife recovery must be on the table, Simon insisted, and he demanded fresh analysis, thinking and information to inform the process. He sent the agencies back to the drawing board for a new biological opinion and full National Environmental Policy Act analysis, which “may well require consideration of breaching, bypassing, or removing one or more of the four Lower Snake River dams,” to be compliant with the law this time, Simon wrote. The farthest inland of the four dams, Lower Granite, completed in 1974, capped a long-held regional economic-development dream to create deep-draft navigation from the Pacific to Lewiston, Idaho. The dams also provide hydropower, as well as irrigation for a small number of growers with large operations along the river. Much has changed since the last review of the Columbia and Snake river hydropower system, including hard lessons about the risk of climate change to fish as warming water challenges their survival. The changes in snowmelt patterns, drought and warmer weather make the dams even more detrimental for salmon and steelhead, which require cold, clean, oxygenated water to survive. 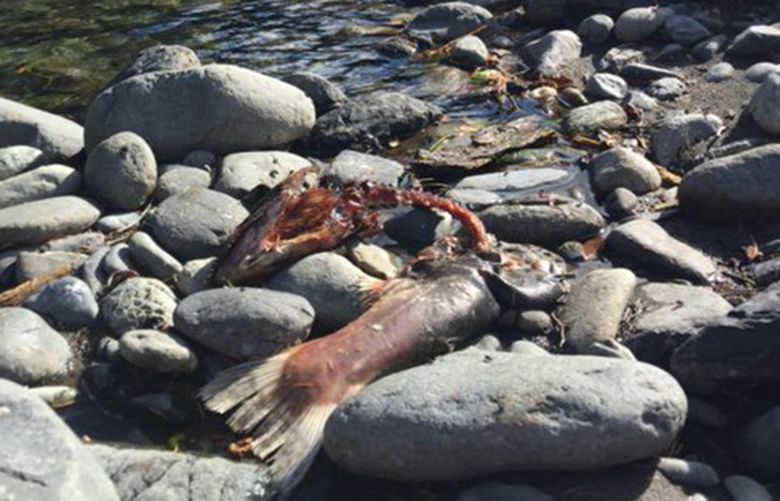 During the brutal summer drought of 2015, after a record-low snowpack, many fish runs were hammered and, in particular, very few sockeye made it back alive to their spawning grounds. In addition to climate change, the dynamics of the power grid have changed, with more sources of energy coming online, including wind power. The economics of navigation on the Lower Snake waterway are also under scrutiny, with usage by shippers in a steady slide and maintenance costs on the rise. Shippers increasingly use double-stacked railroad cars and trucks instead of barging, and container shipping has come to an end out of the Port of Portland. Scientists are also gaining a better understanding of the web of life that depends on salmon to survive, which includes endangered orca whales. Diet studies have determined they depend nearly entirely on chinook salmon, including fish from the Columbia and Snake system.